Jesus used this type of verbiage during His ministry, particularly when speaking of His role in revealing the Father to His disciples and declaring the gospel (Matt. 11:25-27, John 14:6-10). Interestingly, the word translated “reveal” in these verses is apokalupto, also translated “revelation” (as in the book of Revelation). God consistently uses the theme of light and darkness as an analogy for His calling and the need to separate ourselves from this present world. Peter tells us, “But you are a chosen generation, a royal priesthood, a holy nation, His own special people, that you may proclaim the praises of Him who called you out of darkness into His marvelous light” (I Pet. 2:9). John states this even more clearly: “God is light and in Him there is no darkness at all” (I John 1:5). Darkness is not a thing in and of itself—it is the absence of light, and even a tiny light helps negate absolute darkness. Darkness symbolizes the absence of God, which is why the very first thing that God did during the (re)creation of Genesis is to bring light. It symbolically combated the darkness, where Satan works, and began to illuminate God’s creation. A similar thing happens to us when God begins to work in our minds. 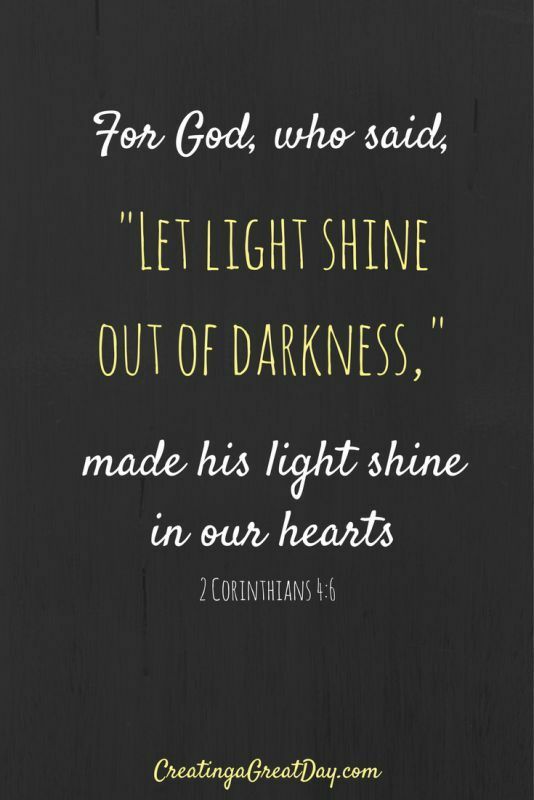 “But even if our gospel is veiled, it is veiled to those who are perishing, whose minds the god of this age has blinded, who do not believe, lest the light of the gospel of the glory of Christ, who is the image of God, should shine on them…For it is the God who commanded light to shine out of darkness, who has shone in our hearts to give the light of the knowledge of the glory of God in the face of Jesus Christ” (II Cor. 4:3-6). Are we reflecting the illumination of our Creator, bringing a tiny light to the darkness of this world? Whether through honesty, graciousness, patience, positivity, or myriad other qualities, it’s a question worth asking ourselves. I don’t mean things like overt evangelizing, but rather considering whether our co-workers or peers would think of us in this manner regardless of what they think about our beliefs. Why does that even matter?? Like the moon, the light we reflect comes 100% from another source. Again, this isn’t some amazing insight or “new truth”, but I do believe it’s important. It’s easy for us to hear a statement like “you are the light of the world, so let your light shine” and forget that it’s not actually about us or our light, because we can’t do anything on our own. I believe it’s meaningful that, of all the dozens of different descriptors and names assigned to God and the Son throughout the bible, it’s that Greek word phos that’s used to describe the Son from before man’s beginning. There’s no guesswork or ambiguity to the analogy of Jesus as light. He literally says, “I am the Light of the world” (John 8:12), and this role of His is prophesied in Isaiah 10:17 as well. Jesus was the Light pointing the way to God and illuminating the path to get there (Matt. 4:16, John 8:12, John 12:35-37). John gives an unambiguous litmus test we can apply to ourselves, saying “God is light and in Him is no darkness at all. If we say that we have fellowship with Him and walk in darkness, we lie and do not practice the truth” (I John 1:5-7). This imagery was made clear from the early stages of God’s interaction with His chosen people. He (the Word) led the Israelites as a pillar of fire by night, giving them light in the darkness and illuminating the path out of Egypt (Ex. 13:21, Neh. 9:12). In the tabernacle and then the temple, a lamp burned oil continually, the flame symbolic of God’s presence (Ex. 27:20-21). So what does it mean for us to reflect God’s light? At its heart it means that when people see us and interact with us, it should be like an interaction with our Father—they should “get” what He’s like. These verses and many more make it clear that we are supposed to be being remade in His image from a spiritual and mental standpoint. If we are, then that is what people should see; if it’s not, then God may not recognize us when the time comes. It’s one of the reasons that Jesus warned His disciples, “Many will say to Me in that day, ‘Lord, Lord, have we not prophesied in Your name?…And then I will declare to them, ‘I never knew you; depart from Me, you who practice lawlessness!” (Matt. 7:22-23). If we are a reflection of His image and reflecting His light, that’s simply not possible—it would be like each of us looking in the mirror and not recognizing ourselves. And if it’s the case it means we’ve likely become disconnected from Him along the way. No light in our physical world is self-sustaining, and neither is ours. No matter the type of light—lamp, flame, solar-powered, even the sun itself—if lights get disconnected from their power source, they eventually lose charge, weaken, fade, and die or burn out. Likewise, we have to continuously recharge our connection by replenishing the oil in our lamps: God’s spirit. We looked at a bit of II Cor. 4 earlier, but letting Paul finish his thought ties this theme of our power source together nicely. God gives His people a measure of His spirit to carry within us, which is the oil that should be feeding the light we reflect. But that little light is not yet infinite or eternal if we don’t tend to it—the five foolish virgins discovered this in Jesus’s parable when they ran out of oil (Matt. 25:1-13). This is another sobering example where Jesus says “I do not know you”, because the five foolish virgins had lost connection to their light’s power source and were no longer reflecting the Light. Paul makes clear that not only are we to be reflecting God’s light, but it should be becoming part of us—it’s literally a portion of our inheritance. He writes the Colossians that they should give thanks to God our Father, “who has qualified us to be partakers of the inheritance of the saints in the light…He has delivered us from the power of darkness and conveyed us into the kingdom” (Col. 1:12). Because He is light and we are His children, our inheritance is His light. We, like Esau, are at risk of losing out on our inheritance if we run out of oil. But we need to be worried not only about becoming disconnected from our power source, but also because there’s another danger that can affect whether we’re reflecting God’s light. We had this cool brass candleholder when I was a kid, with a big glass shade encasing the flame. We didn’t use it all that often (mostly when the power was out), but over time the brass and glass became blackened and dull, and rather than it reflecting light, the flame could barely be seen. The light was the same, but the vessel containing it had fallen prey to pollution. Even when we have God’s spirit and are reflecting His light, we have to watch out for the impact of our society’s norms, values, and distractions. It’s almost impossible to be completely unaffected by the world we live in, so we have constantly be alert. In the olden days, if a lighthouse wasn’t constantly cleaned and maintained, the sea salt and minerals, dust, and smoke from the flame would cake on and dim the light, rendering it useless. To me, this is a lot like what happened to Lot (Gen. 19). Lot knew God. He believed in Him. My guess is he largely followed God’s commandments. But Lot was living in Sodom and Gomorrah, and over time, bit by bit, rubbing elbows with that society changed him without him even noticing. Personally, I think that’s really what Paul was talking about when he told the Corinthians, “Do not be unequally yoked together with unbelievers. For what fellowship has righteousness with lawlessness? And what communion has light with darkness?” (II Cor. 6:14). He wasn’t telling them to remove themselves from society altogether and live out in the desert. And maybe he was speaking about marriages, as many people think. But I also think this has to do with close relationships and how we choose to spend our time. There’s a reason we closely monitor the friends our kids have and who they’re spending time with—we know that the company we keep ends up becoming who we are. But sometimes we forget to put that into practice in our own lives. God gives a warning to those who “call evil good, and good evil; who put darkness for light, and light for darkness” (Is. 5:20). It’s easy to read this and think of other people, of those not called. But God wasn’t talking to pagans or Gentiles in this passage…He was talking to His people! And it doesn’t just mean literally substituting evil for God’s way—it can also include putting our own traditions above God’s laws or intents, or our own priorities over His desires. Jesus addresses this idea of the lamp getting affected by its surroundings. He told His disciples, “The lamp of the body is the eye. If therefore your eye is good, your whole body will be full of light. But if your eye is bad, your whole body will be full of darkness…no one can serve two masters…you cannot serve God and mammon (money)” (Matt. 6:22-24). Conclusion: What does it mean to “let your light shine”? Are we reflecting the Light? God’s light is a metaphor for our physical life as well—without light, nothing living can survive. One of the last pieces of God’s wrath that this world will endure is complete darkness, which will prevent anything from growing and be a breeding ground for fear and hate, a representation of this world’s true state without God (Rev. 16:10-11). When Jesus struck Paul blind on the road to Damascus, He told him that he was being sent to both Jews and Gentiles “to open their eyes, to turn them from darkness to light…that they may receive forgiveness of sins and an inheritance among those who are sanctified by faith in Me” (Acts 26:18). These are the stakes for us, and this is the light we’re meant to reflect as a “city on a hill”. Are we reflecting the Light, or has our light dimmed?